It's finally starting to feel like spring here, so what better way to celebrate that than with a little bit of floral! I love this floral print top from Target's Who What Wear line. (Well, to be quite honest, I love everything from the line!) If the print looks familiar to you, that's not surprising because I also have the skirt version that I wore about a month ago in this post entitled Maxi Flowers. With that look, I wore the floral skirt with a black and white striped turtleneck, but here I am clearly doing the opposite with floral on the top and stripes on the bottom! Clearly, there is just something about the combination of stripes and florals that I am just naturally drawn to. It's certainly a winning combination! I am also drawn to all of the blooming trees and flowers that have been present here on Southern California over the last month or so. 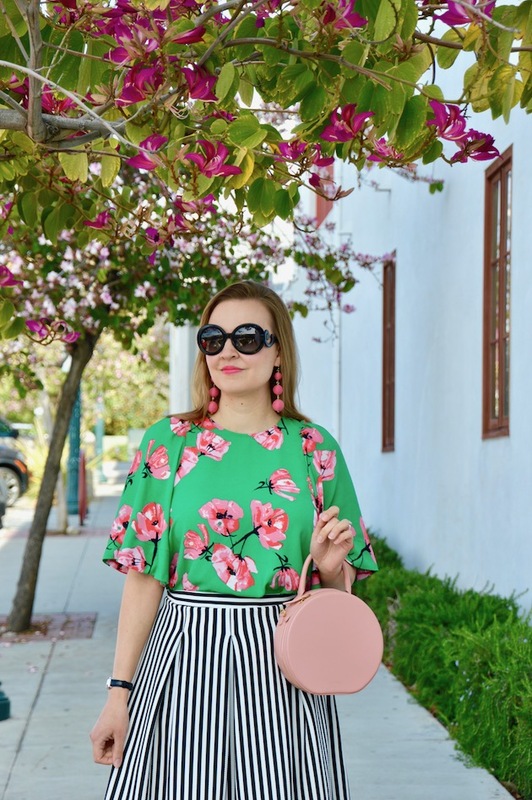 I tried to capture some of these here to give this outfit a springtime feel because nothing says spring like a fantastic floral print and some gorgeous flora to match! 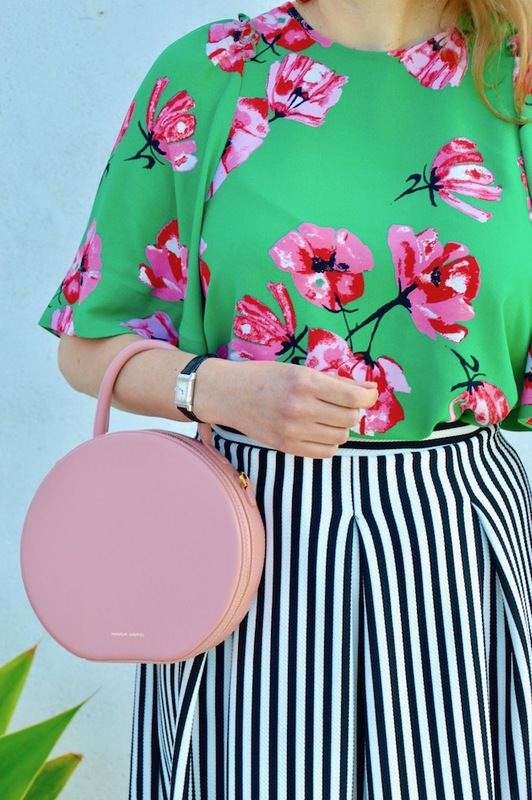 The bold stripes and floral pattern make such a statement together! It's fun and as always you have complimented each piece! Such a pretty top Katie! I love the green wit the pink flowers, a fav mix! 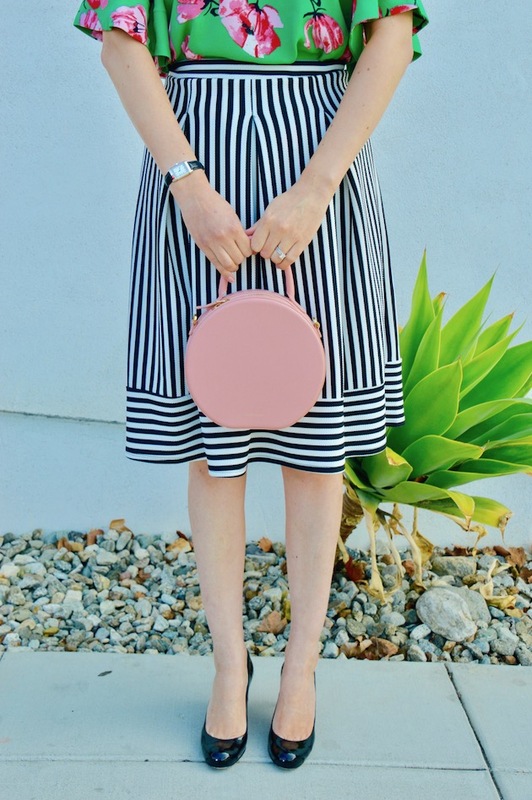 Your cute circle bag looks perfect with this look. You are so good at patern mixing!